Everyone knows how stubborn the hardened steel surfaces are when it comes to bore the drill bits on it. It shows that you badly need some best drill bits for stainless steel so that you can deal with it. However, it is not an easy task to take the challenge up for penetrating through the steels. So if you think regular drill bits can do the job for you then let me say, you are wrong! Drill bits come in a variety of sizes, shapes, design, and coating, hence it is essential to choose the right one for the right material. Right steel drill bits help you to bore the hardened steel easily no matter how hard they are. If you don’t have much time to read full reviews, check our top 3 picks drill bits below in short! DEWALT is one of the most popular brands for different kinds of tools. You can say that they also have some drill bits for drilling stainless steel to offer. 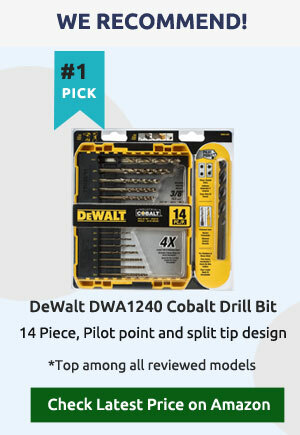 DWA1240 is a drill bit set that comes with 14 pieces of drill bits. Moreover, these cobalt-coated drill bits are convincing enough to slice through the hardest stainless steel surfaces. Their high-speed execution is something that you look for. They come with a pilot point and a split tip that allow them to start on contact to get clean accurate holes. The no bit-walking factor is another great trait for more control. The drill bit set includes 14 pieces of drills. Pilot Point and split tip design. You will get two 1/16-inch bits, one 5/64-inch bit, one 3/32-inch bit, one 7/64-inch bit, two 1/8-inch bits, one 9/64-inch bit, one 5/32-inch bit, one 3/16-inch bit, one 7/32-inch bit, one 1/4-inch bit, one 5/16-inch bit, and one 3/8-inch bit with the set. You can get accurate holes via drilling on the surfaces. Cut the hardest stainless steel efficiently. Durable and perform in high-speed, thus you can drill faster and smoother. You will get combinations of 4 larger and 8 smaller bits with the set. The bits remain sharp for a very long time. The bits do not damage the surfaces. You will get a case with the bits. The carrying case is a bit tough to open. If you are looking for the newest technology in drill bits,you should check out these 29 great pieces of drill bits. These bits pierce the surface so smoothly that you can enjoy every bit of it while drilling. This M42 set includes bits that are coated with high-speed steel cobalt, quite durable for you. You can pierce the bits over the hardest steel like truck frames, stainless steel, farm implements, spring steel, grade 8 bolts, and more. The bit comes with a melting point of 2,853 degrees Fahrenheit. Not only that, it features 135-degree split point that helps to upturn the cutting speed and yes it inhibits walking as well. It also has three sides with flat ends that help to prevent spinning in the chuck. It constructed with Premium Solid Cobalt M42 Super High-Speed Steel. 1/16-inch to 1/2-inch at 1/64th Increments. High Heat Treated Hardness 68-70 HRC. Comes with a melting point of 2,853 degrees Fahrenheit. The split point helps to inhibit walking. The three flat end shank helps to prevent spinning in the chuck. Drills very smoothly and gives accurate and clean holes. It does not damage the surfaces. The tips are razor sharp and cut like butter. The bits are strong and sturdy. The set includes 29 pieces ranging from smaller to larger bits. The case that comes with it is a little cheap, so it is of poor-quality. Bosch CO21 is another good product that you can think to grab. They claim to offer 4 times longer life than other standard drill bits which show how durable it is. It also gives outstanding performance in penetrating the stainless steel surfaces with easy. Coating with cobalt, Bosch has constructed the bits for all the pros out there who are looking for solid and reliable bits. These bits definitely stand out from the others. Be it stainless, cast iron, or high-density steel, these bits cut through them effortlessly. The bit features split-point with no skate tip for giving you cleaner and accurate holes. If you want stronger bits for stainless steel then you can try with this. Split-point with no skate tip. Designed for very high drilling and high visibility marking. You will get two 1/16-inch bits, two 5/64-inch bit, one 3/32-inch bit, one 7/64-inch bit, two 1/8-inch bits, one 9/64-inch bit, one 5/32-inch bit, one 11/64-inch bit, two 3/16-inch bit, one 13/64-inch bit, one 7/32-inch bit, one 15/64-inch bit, two 1/4-inch bits, one 5/16-inch bit, one 3/8-inch bit, and one 1/2-inch with the set. Coated with cobalt for great durability and longer life. Cuts through the hard stainless steels with ease. Can also drill overother materials like high-carbon steel as well as wood and plastic. 3/16-inch bits feature three-flat shank design that offers an outstanding control and guards. The split-point tip constructed for no-skate starts and gives a cleaner and accurate hole. The set sometimes does not come with a case and sometimes come with a faulty case. The sizes are written in smaller, so it is quite difficult to read their sizes. KFDRSD Series from Drill America is one the most popular drill bit for drilling stainless steel. The manufacturer has designed the bit with a premium grade high-speed steel for its durability. The Killer Drills come with a durable split point for self-centering and reducing thrust. Its black and gold surface gives the bit a nice look. Additionally, the shank drill can penetrate effortlessly on stainless steel or other hard surfaces. The wear resistant round shape Shank drills come with flat ends of the three sides. So it helps to provide sufficient grip when used with chucks. Not only that, it is also very easy to get rid of the chips while drilling as the spiral flute eliminates chips when the tool moves counter-clockwise direction. Gold and black surface to drill over stainless steel and other hard surface. Round shanks and 135 degrees split point. The spiral flute tools eliminate chips when the tool moves towards a counter-clockwise direction. Weighs 10.4 ounces.And a regular 1/2-inch drill bit. The shank is true and the cutters are perfectly machined. High-speed steel drill bit easily drill holes over stainless steel. The bit comes with three sides that have flat ends for better grip and control. The spiral flute tosses out the chips when run in counter-clockwise direction. No hassle of clogging while drilling holes. Perfect for drilling materials of low and medium tensile strength. Because of the spiral flutes, the bit might vibrate for which it develops many ridges in the holes. You can also check out these drill bits for stainless steel which have been manufactured from Neiko. The 10197A Titanium Step Drill Bits are ideal for beginners mostly as they are easy to use. You can drill the bits over plastic, aluminum, copper, stainless steel. Besides, the bit does not only drill holes bit also smoothly enlarges the holes over the steel surfaces. The drill bits feature double flute for swift control and excellent grip. The bits are self-starting and they do not need extra effort to drill the stuff. They are fast enough to quickly make many holes in lesser time. Classic high-speed steel with titanium coating. 135-degreesplit point tip and two flutes design. Includes a sturdy aluminum organizing case. Drill Bit-set 5 (6 steps): 3/16-inch, 1/4-inch, 5/16-inch, 3/8-inch, 7/16-inch, and 1/2-inch. Can drill over plastic, aluminum, copper, stainless steel. It enlarges the existing holes in your steel surface. Features double flute, so it provides faster chip evacuation. Comes with a case for secure storage and easy carrying. Drills very quickly in lesser time. They sometimes do not hold their points. The bits might give ridges in the holes. If you are looking for bits to drill a quick hole on steel surface, these bits from Neikoare 10194A are a good option for the money and quality. The features are almost like the previous one from the similar brand, thus it is another perfect bit for stainless steel. Like 10197A, this one is also constructed with high-speed steel titanium. With its performance and durability, the bit has proven to be the best of other ones. Besides, you can use the bit on plastic, aluminum, copper, stainless steel. Just press the drill and then pierce the surface with ease. It also features 135-degree split point tip. It helps to boost up the penetrating speed with self-centering and inhibits walking. Its two-flute design is another great addition to the bit that helps to eliminate the chips quickly. Neiko 10194A Titanium Step Drill Bit comes with flat ends of the three sides that fit into power tools chuck securely and evacuate slip. If you want stronger bits, you can think of taking them to the list. It comes with classic high-speed steel with titanium coating. 135-degree split point tip and two flutes design. Includes 10 step sized: 1/4-inch, 3/8-inch, 1/2-inch, 5/8-inch, 3/4-inch, 7/8-inch, 1-inch, 1-1/8-inch, 1-1/4-inch, and 1-3/8-inch. It drills through thin wall stainless steel with ease. It can pierce plastic, aluminum, copper, stainless steel. Double flute design, hence it provides faster chip evacuation. The drilling takes some seconds to hole. The split point tip helps to boost up the cutting speed and inhibits walking. Drilling at a higher speed might ruin the bit. The edges have scratches, which is quite disappointing. The bit might leave a burn mark. So, my 7th pick is also another one from mighty DEWALT. To talk about its features, it provides maximum speed and life in toughest steel. DW1263 comes with a set 14 pieces cobalt-coated drill bits. They are sturdy and fast enough to give a precise cut. Moreover, the torque functions like a pro that allows to bore the holes with excellence. Like DWA1240, this one also comes with a pilot point feature that offers high-performance. You can penetrate through the toughest stainless steel with ease. The case is packed in durable ABS material in compliance to the industry grade. Its faster cutting performance and durability prove it one of the best drill bits for drilling stainless steel. The case is coated with industrial-grade ABS material. The bits pierce the toughest stainless steel amazingly fast with less effort. Does the job of drilling a long time before needing sharpening. The pilot point is sharp enough to give a perfect hole. The tips are superbly sturdy. Comes with the set combining 4 larger and 8 smaller bits. They never leave any scratch on the surface. Durable and even cuts the tampered steel smoothly. The smaller sized bits are quite brittle. Let me introduce you to the last but not the least one, which also features perfect elements that make it most popular drill bits for steel. Like the other two stated in the previous, these bits from Neiko are another great bits to enjoy your drilling job. With high-speed steel titanium coating, the bits define its durability and sturdiness. The bits come with 3-piece set that can drill over any hardest surfaces. Be it plastic, aluminum, copper or stainless steel. Neiko 10193A features 135 degrees split point tip that upturns the piercing speed with self-centering. It helps to inhibit walking as well like the other two products from the same brand. Neiko has also included three-flatted shank which evacuates the slip and adjusts to the power tools chuck securely.You can easily change drill bits. The bits come with 3-piece set. It’s very useful when making holes in automotive applications. It can peel material in thin layers very smoothly and satisfyingly. The bits give bigger hole in the same point. It’s very comfortable rotating the bits. It gives a very clean cut. Ideal for both novices and pros. It tends to lose its shape when heating. You might get some faulty bits with the set. Low Carbon Steel: These kinds of materials are quite dull compared to others. They often require sharpening to cut the surfaces. The low carbon steels work well for piercing through materials like soft plastics or wood. High Carbon Steel: These materials often tend to lose temper while drilling. The shape gets distorted when overheated. They are mostly used for boring wood or steel. High-Speed Steel (HSS): These materials are for drilling both harder and softer surfaces. They defy heat and stay sharp for a longer time. Besides, they work great on penetrating wood, fiberglass, PVC (polyvinyl chloride), and aluminum. Cobalt: These materials are tremendously hard and best for cutting harder surfaces. They also defy heat very quickly and perform great on the toughest surface. Additionally, they are also the most favorite of all the pros as they are popular for their longer life and high-performance. Perfect bits for drilling stainless steel. Titanium-coated HSS: Such materials tend to produce lesser friction and give high-performance. They are sturdy and very sharp for drilling any kind of surface. They are basically for boring wood, steel, fiberglass, and PVC. This one perform well with matrix drill. Carbide-tipped: These kinds of bits stay sharper than the most other materials. They work great for piercing surfaces like tile and masonry. They are the best drill bits for hardened steel. Different types of shapes are used for different surfaces. You can never use any type of bit shape to bore any type of surface. Thus, this is just to give you a little idea of the function of the bit construction. Twist Bit: It is one of the most mainstream types of drill bits. They are usually for boring hardened steel surfaces, yet if you want, you can use them on other kinds of material as well. However, they are perfect for drilling in wood, plastic and light steel. Split Point Bit: Like the twist one, this kind of bit is also for steel drilling. It features a split point unlike twist bit and it allows maintaining self-centering in the toughest surfaces. Its various points and angles are sharper so that it can precisely cut through the surfaces. Brad Point Bit: This bit is one of the most favorite bit of woodworkers. It has a sharp tip that positions the bit precisely for an accurate hole and maintains the center while drilling. Its flute-groove is another great feature that wraps around the bit and evacuates the chips and the remains. Auger Bits: They are longer in shape hence they penetrate long and produce rough holes through the surface. The long spirals help to pierce the material and remove the remains after the drill. They come with a screw tip that starts the hole and pulls the bit through the surface get a clean hole. They pierce greatly through woods or framing studs. Spade or Paddle Bits: Such bits look like the spade for which we call it spade bit. They basically pierce large-diameter holes in the wood. These bits have flattened blade yet a sharp point that helps position and steady the bit. Hole Saw Bits: they drill larger holes that come with two parts: a twist bit and a circular saw ring with serrated teeth. They produce smoother holes and are used on tile and masonry. Step Bit: They drill the surface up to 1/4-inch diameter. The step bit works great on wood. Its stepped design helps to use a single bit to bore holes in different diameters. You can use this bit to produce clean holes with the chip evacuations. Masonry Bit: This type of bit pierces through the most stubborn and hard surfaces. So, they work great on concrete, brick and other masonry materials. They work with a corded or cordless rotary drill to penetrate the masonry more precisely. Such bits perform with hammering action of the tool. It lets the carbide tip drive into the material while the swivel feature helps to eliminate the debris. As I have picked up the drill bits for stainless steel, I will talk about the advantages you can get from the Cobalt and the Titanium bits. If you have a powerful electric drill machine then you can drill a hole easily. Since they both are designed for the same purpose to drill the toughest surfaces. The benefits you can get from Cobalt bits are: Cobalt drill bits are coatedin cobalt steel. It makes them hard enough to penetrate through the tough metals such as stainless steel. Another benefit of the cobalt is, it helps to resist heat quickly while drilling. Talking about the sharpness, the cobalt indeed stays sharp for a long time. The benefits you can get from Titanium bits are: Titanium drill bits are manufactured from titanium ceramic material over high-speed steel. They are sturdy and durable enough to pierce through the hardest materials.They also have some very strong and powerful drill bits for stainless steel like the Cobalt one. Moreover, such materials also help to defy heat. However, they are also suitable for wood and plastic other than the steel. Talking about the sharpness, titanium tends to hold sharpness for a longer time as well, and they are more durable and harder than the other materials. Q. Would DEWALT DWA1240 bit drill into a wheel stud on a car without breaking? A. Yes, it would but with some lubricant oil, it’s better you use a center punch to mark the center and to give the drill a center point. Q. Where was DEWALT DWA1240 drill bit made? A. The bits are made in Germany. Q. Can cobalt drill bits drill hard stainless steel? A. Yes, they can drill hard stainless steel. Q. How brittle are cobalt drill bits are compared to titanium bits? A. Cobalt drill bits are a bit more brittle than the titanium bits as they are entirely coated with steel. Q. Can DEWALT DW1263 drill the bits through ceramic tile or cement wall? A. No, you cannot use them to drill ceramic tile and cement wall. Q. Can Drill America KFDRSD bore into aluminum materials? A. Aluminum is a softer and you can use this on any hard and soft surfaces for drilling. Q. Can Neiko 10194A Titanium Step Drill Bit work on wood? A. Yes, Neiko 10194A can drill into wooden materials and perfect for your garage DIY work. As stainless steel is a hard-hitting material, you must have strong bits to hit them. To get the best drill bit for drilling stainless steel, it is essential to look for the features that have higher life and gives higher performances. It’s because bad drill bits will give you a bad working day. I have chosen some top rated products in this review. So grab them, give them a try and check out yourself. I am sure they won’t disappoint you.